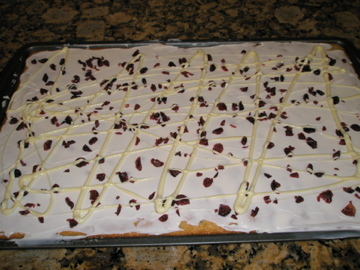 Cranberry Bliss Bars, nothing says holiday treat more to me than these pretty, decadent, and sweet bars. You may have tried a version of cranberry bliss bars from Starbuck’s or some other coffee house, but I assure you these are better. 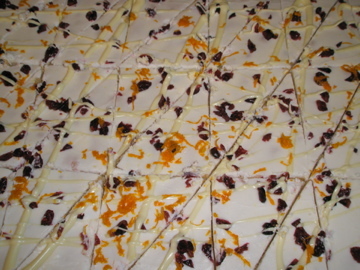 Packed with dried cranberries, white chocolate chips, and flavored with orange, cinnamon, ginger, and cloves these bars are full of taste and a great end to a big christmas dinner. One drawback to these is that they require a hefty number of ingredients that even I don’t keep lying around the house. On the plus side however no one ingredient is expensive and you can always take shortcuts and buy store frosting in lieu of making your own, or use orange zest in the batter instead of orange extract saving both time and money. Despite the nuisance of gathering all the necessary ingredients, these cookies are perennial favorites of mine because they look awesome and taste amazing too. So hurry up and make you list! and quit putting off culinary bliss. While the recipe might look a little involved it is actually really straightforward and easy to pull together. After mixing together the base and baking a process which all told takes about 30 min. 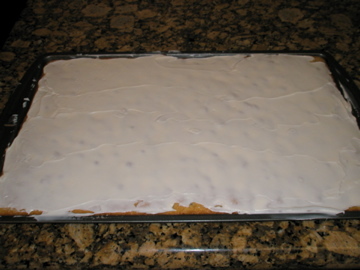 Allow the cookie to cool slightly before spreading a thin layer of orange infused frosting over top. still moist so the cranberries have something to adhere to. Now melt about 1/2 a cup of white chocolate chips in a bowl and transfer to a re-sealable plastic bag. Cut a small hole towards the tip of one side of the bag and then quickly drizzle the cookie with the melted chocolate. Now, grab an orange and using a micro-plane zest over the cookie. Slice in to triangles or your preferred geometric shape and voila! Bliss in a cookie. For the bars: Preheat oven to 350 degrees. Line a 15-by-10-inch jelly roll pan with silicone liner, aluminum foil or parchment paper. If you are using foil or parchment paper, coat it with nonstick cooking spray. In a bowl, stir together the butter, brown and granulated sugars, eggs, and orange oil. Add the flour, baking powder, ginger and pumpkin pie spice, and beat until the flour begins to blend into the batter, about 1 minute. Stir in the cranberries and chips, being careful not to over mix. Spread the batter into the prepared pan, and bake until a skewer inserted into the center comes out with a few crumbs adhering to it, 15 to 17 minutes. Remove from the oven and let cool for 30 min. in the pan on a rack. For the frosting: Beat cream cheese, butter, sugar and orange oil together to a spreading consistency. If needed, add a few drops of milk to thin. Spread over cooled bars. 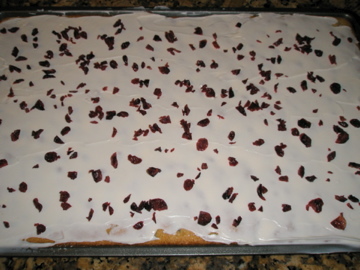 To garnish: Roughly chop dried cranberries and sprinkle evenly over the frosting. For the drizzle: Melt chocolate in the microwave heating at 30 second intervals and stirring until you achieve a smooth consistency. 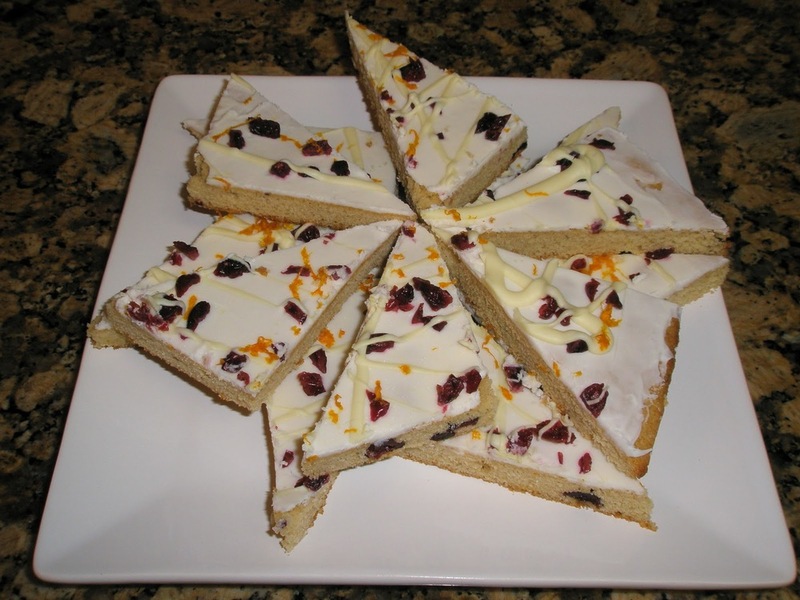 Drizzle the frosting over top in a decorative pattern and top with the orange zest. The bars freeze for up to 6 weeks, or refrigerate for up to 3 days. Store leftover bars in the refrigerator. *If you don’t have pumpkin pie spice you can also make it from spices that you already have. Here is a quick recipe: 2 tsp. ground cinnamon, 1/2 tsp ground nutmeg, 1/2 ground ginger, 1/4 tsp. ground cloves.